Claire Kelly had a triumphant little smile and tears glistened in her mom’s eyes as the 11-year-old rode a two-wheeler on her own for the first time. Experts had predicted that would never happen. But Claire and a special program called iCan Shine proved them wrong. 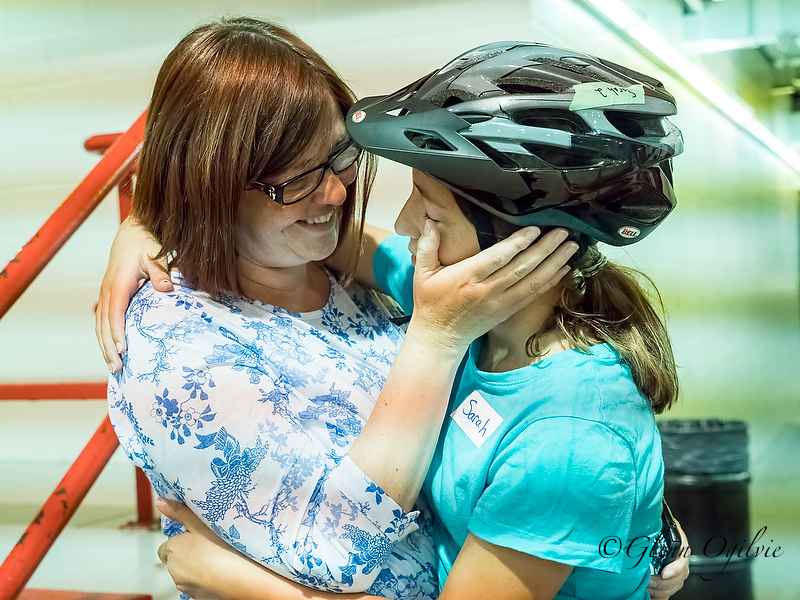 Both beamed as Catherine helped her daughter, who has autism, get back on the bike. 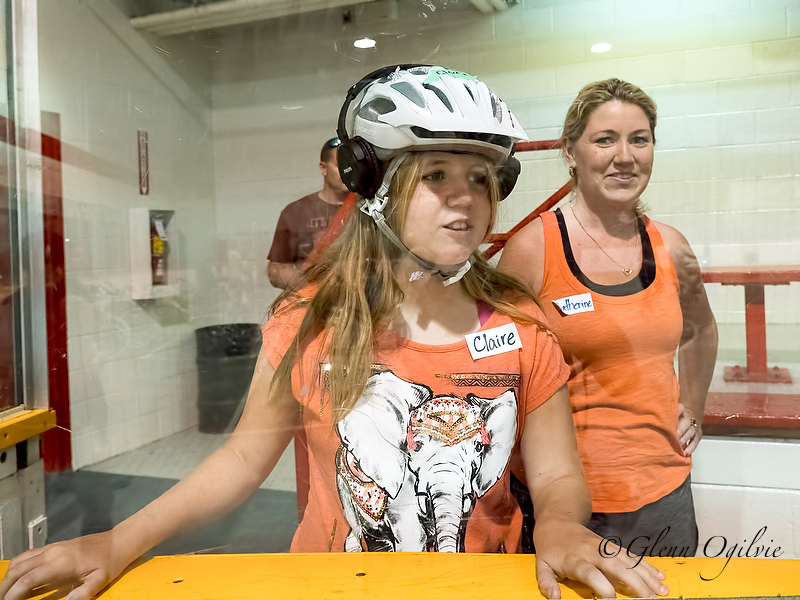 Claire was one of 25 participants with disabilities at Clearwater Arena learning how to ride a conventional two-wheeler with iCan Shine. 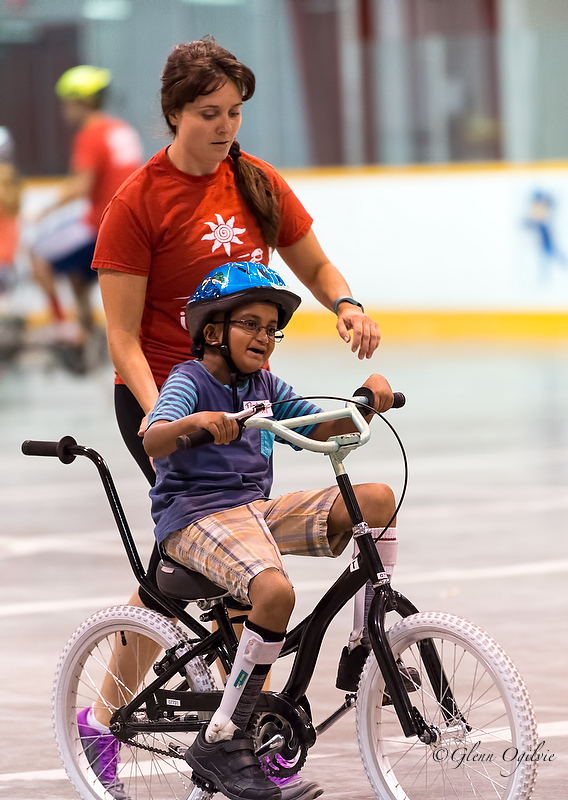 The international charity offers weeklong bike camps across North America. iCan Shine’s technique involves trained staff who instill confidence, enthusiastic volunteers and patented machinery engineered at the University of Illinois. Rollers attached toward the back of each bike drag on the ground and create stability. As riders acquire better balance, the roller size is decreased until the roller is removed entirely. 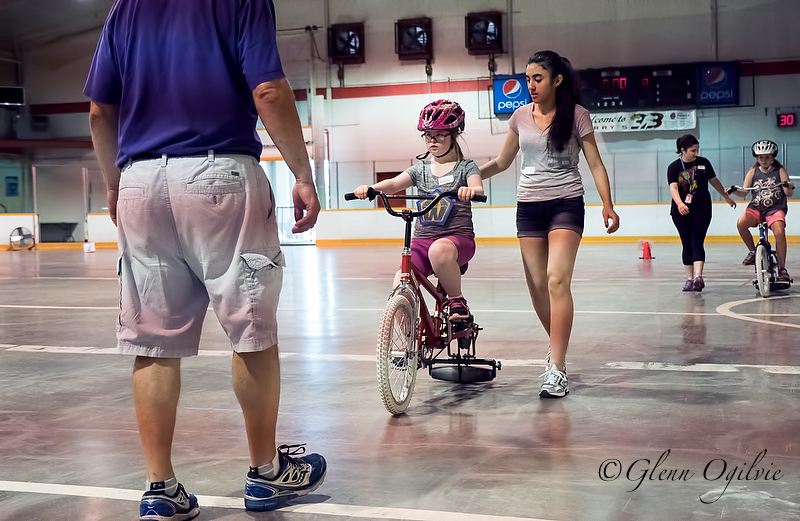 The iCan Shine website says 80% of participants learn to ride on two wheels by the end of camp week. 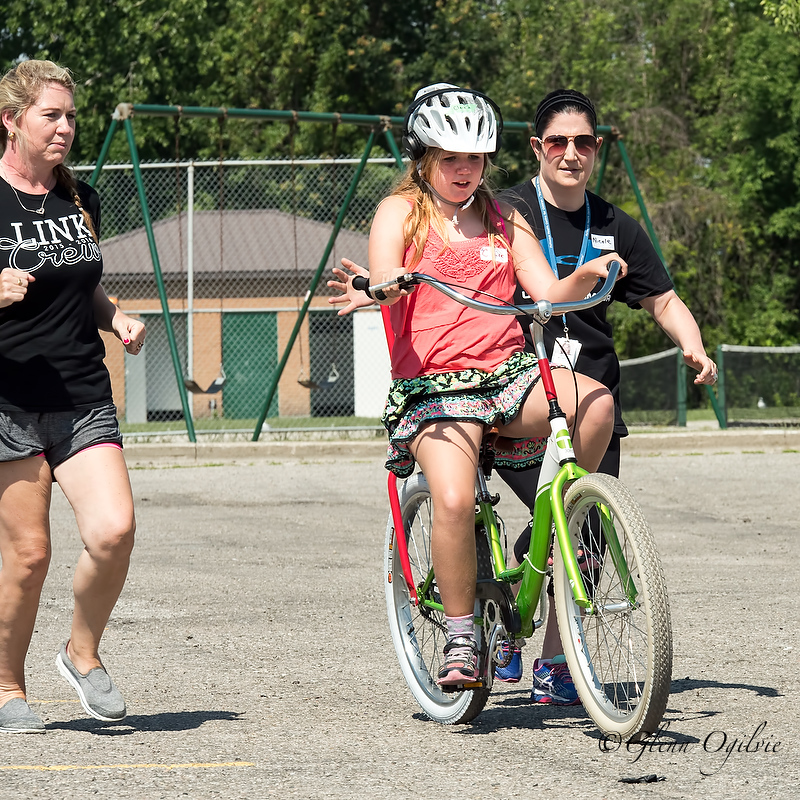 “Biking is one of those life skills like swimming that parents want their children to do,” said Cindy Hughes, recreational therapist at Pathways Health Centre for Children. 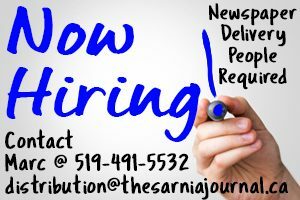 Pathways hired iCan Shine and brought the camp to Sarnia. Participants at last week’s camp had disabilities ranging from autism to Down syndrome to cerebral palsy. Most were children along with a few adults. Claire Kelly loved riding a bike with training wheels when she was younger, her mom said, but she lost interest when she couldn’t the balance without those training wheels. “Riding a bike is a childhood rite of passage and it’s not as easy for some kids,” said Catherine Kelly. She commended Pathways for bringing iCanShine to Sarnia. iCan Shine is effective but pricey, said Hughes. It cost between $15,000 and $20,000 for the week. The GoodLife Kids Foundation and Sarnia Community Foundation covered a large portion and each camper paid $180. From left, Liz Oliveira, biker Sarah Wight, Persia Baha, iCan Shine instructor Manda Krimmer and Olivia Rodenhuis are nearly ready for Sarah to go solo. 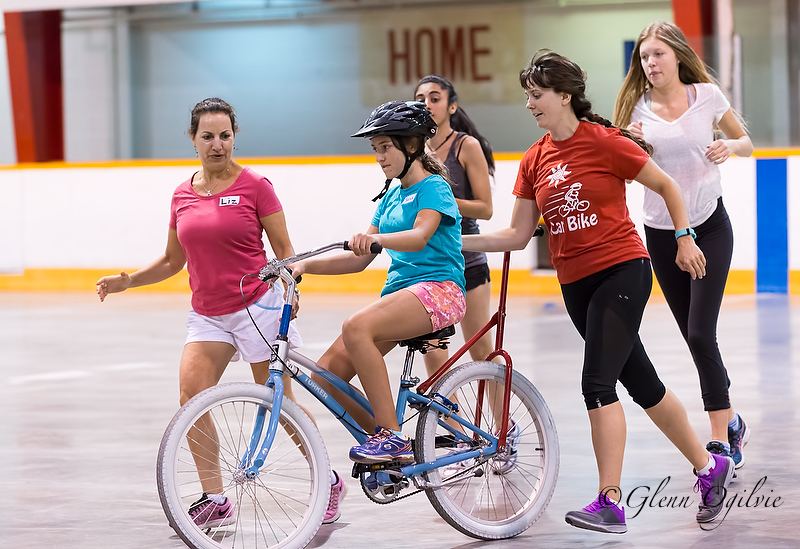 Claire Kelly, 11, watches as her classmates learn to ride at Clearwater Arena, with mom Catherine Kelly looking on. Rider Rahul Dighe goes for a spin with help from Janda Krimmer. A roller helps keep rider Heather McAllister stable, with additional support from Frank Brennan and Persia Baha.